As per the reports, India is planning to buy 18 bullet train sets from Japan. This deal will be done at a cost of approx. Rs 7,000 crore which includes a pledge to transfer technology for local production. 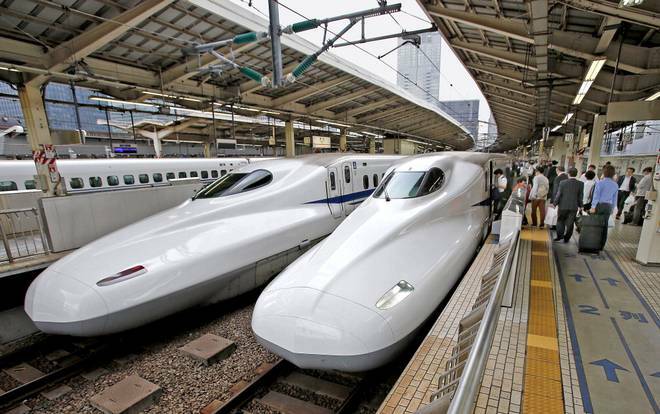 An official said that India will get 18 Shinkansen trains set from Japan. It is known that Japanese bullet trains are among the safest in the world and those imported will have automatic protection systems to ensure safety. India’s first bullet train is expected to start running by the end of year 2022. These trains will run between Mumbai and Ahmedabad. Each of these trains will have 10 coaches. These would be able to cruise at the speed of 350 km per hour. These trains will reduce the travel time to about 3 hours. It is expected that bullet trains will witness almost 18,000 passengers. In fact, the fare between the two cities is likely to be less than Rs 3,000 in economy class. In fact, high speed train corridor of 508-km is being built with Japanese assistance. It will have 12 stations with about 350 km of it in Gujarat and 150 km in Maharashtra. To procure high-speed train, Indian government will soon float a tender. Japanese manufacturers will participate to set up bullet trains assembly units in India in line with designs similar to that of Japan Railways. On a public-private participation (PPP) basis, Indian Railways will soon start working on setting up a bullet train assembling facility in India. Previous articleShould Bulls rely on Mid cap and Small Caps, while a weak rupee persists?